This graphic is not meant to represent a view on the wage gap debate, it is just a presentation of the data and does not account for the underlying factors that explain these differences. However, I did add a few comments at the bottom in response to anyone who questions whether the gender gap exists. The animated graphic below shows how gender differences in the workplace have evolved over time, both in terms of employment and wages. Each bubble in the chart represents a specific occupation. 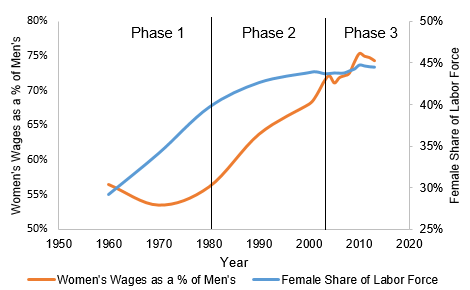 Based on its placement, you can see the percentage of the labor force that is female (horizontal axis) and the average wages earned by women as a percentage of those earned by men (vertical axis). Click on a bubble to see more details. Press play to start the animation. Update Mar-2016: I have updated the graphic to include 2014 data, the latest release from the U.S. Census. The graphic is based on Gapminder’s Wealth & Health of Nations, presented by Hans Rosling in a legendary 2006 TED Talk (recreated in D3 by Mike Bostock). The data is from the Bureau of Labor Statistics, the American Community Survey, and the Current Population Survey (IPUMS-USA, University of Minnesota, www.ipums.org). It includes only full time workers (30+ hours per week). Where reliable data was not available, the figures are interpolated. It wasn’t the current figures I thought were interesting as much as the changes over time. In 1960, the wages of female financial service workers and truck drivers were about 55% of men’s. Today, that number has increased to nearly 80% for truck drivers, but women in finance still earn the same 55% relative to men. 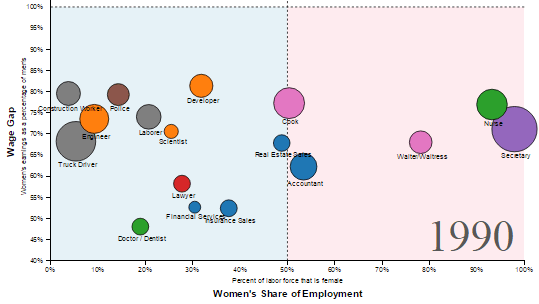 Some occupations even “switched genders.” In 1960 only 15% of accountants were women. Today, there are more women accountants than men. Likewise, cook went from being a mostly female job to one that is mostly men. Right from the start, I was struck by how polarized the occupations were in 1960, as if everything was either a clearly “man job” or a “woman job” with very little in between. And from there things seem to proceed in phases, the first phase being a movement toward the center (i.e. 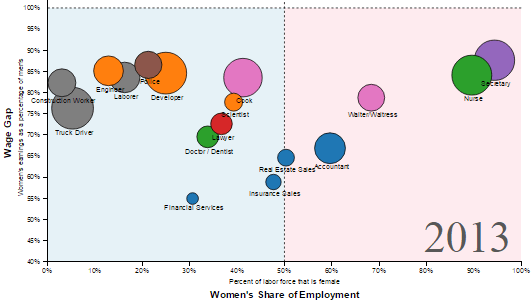 the occupations become less gender specific). The image below is from almost 20 years later. Those male-dominated occupations that were on the left have a lot more female workers, but the overall wage gap has hardly changed. Next, the trend takes a 90 degree turn. The labor force remains more or less the same, but the wage gap gets smaller as the bubbles move upward. … and eventually levels out. Here, another 13 years later, things look more or less the same. The chart below shows the big picture, wages and employment over time for all occupations combined. The same trends from above are clear: increasing female employment with flat wage growth, increasing wages with flat employment growth, and finally flat growth of both employment and wages. 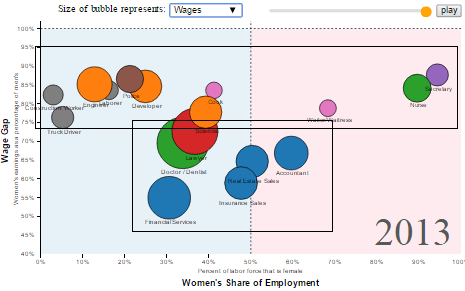 Here is 2013 again, but with bubble size set to represent wages rather than employment. As in 1960, occupations in 2013 also seem to fit into one of two distinct categories, shown in the “T” formation above. First are the occupations where women still earn much less than men: doctors, lawyers, and several business-related professions. These occupations also happen to be the ones with the highest wages, and oddly they seem to have the most gender-balanced labor forces. 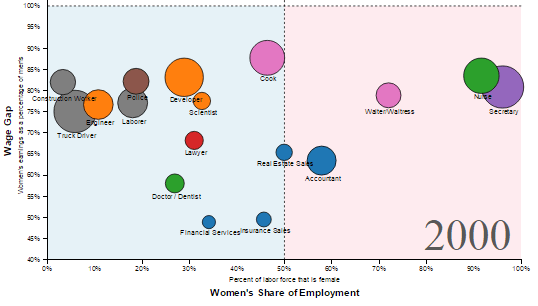 The second group are the occupations in the top bar of the “T”, which are more gender-specific, have lower wages, but with more equality in pay. For this debate, employment data alone does not make a conclusive argument either way because it only shows the outcomes, not the causes. So, I do agree the 78% number that everyone quotes is basically meaningless, since much of it can be explained by differences in occupation, education, etc. To pinpoint the causes, you really need a randomized experiment. Fortunately, there have been many of them, which show overwhelmingly that there is indeed gender bias in the workplace. Previous Article Where Do New Yorkers Come From? Next Article How is the Trump Campaign Spending its Money? The sources are in the notes below the graphic: the American Community Survey, the Current Population Survey, and the Bureau of Labor Statistics. The first two are Census Bureau surveys. The data is from the Bureau of Labor Statistics, the American Community Survey, and the Current Population Survey. It includes only full time workers (30+ hours per week). Where reliable data was not available, the figures are interpolated. Think about the Doctor arena. You said “oddly,” which implies your framework for viewing this data is that “more gender-balanced professions would have equal pay”. But this thinking misses the main point that many of us have been making about gender pay inequality: There are differences in male and female approaches to work. There are essentially no payscale difference for female or male doctors, and extremely high demand for this skillset, but the yearly take-home pay is dramatically different. Men tend to ignore their families to work more, are usually more competitive, and willing to to take financial risks on independent practices, where chances for higher incomes are increased, but so are schedule stresses and risks of income losses. Women tend to have a better work/life balance, and value schedule flexibility and benefits that hospitals or multiple-doctors practices offer over plain wages. These are natural consequences of a free market. Personally, I think the women make wiser choices than the men as a whole. The female doctors I’ve seen have all been married, but the male doctors have rarely been married-divorced or remain single. I understand your point. 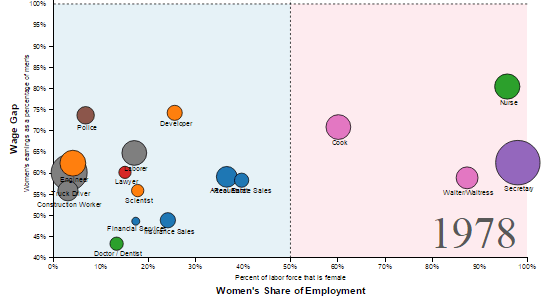 Looking merely at the occupations and wages data ignores the fact that women and men make different choices. It also ignores why they make those choices. Maybe it is because women place a higher value on family life, or maybe because they do not receive as much encouragement as their male piers. There is an infinite number of potential factors not accounted for in this data. That is why I say, “employment data alone does not make a conclusive argument either way because it only shows the outcomes, not the causes.” In order to determine the causes, you really need look at a randomized experiment. There have been many such experiments, and they overwhelmingly demonstrate that women are discriminated against in the workplace. There are links to several of these experiments at the bottom of the post. D3 is a bit unintuitive at first, but very easy to use once you figure it out. If you have any specific questions about it, please feel free to reach out. “There is indeed gender bias in the workplace” “Employment data alone does not make a conclusive argument either way because it only shows the outcomes, not the causes. So, I do agree the 78% number that everyone quotes is basically meaningless”….Hmmmmmm…. Or; the answer for this whole sorry excursion into Leftist social manipulation could be: If you want to find gender bias in the workplace you can twist and manipulate the data to find gender bias in the workplace..
Nope. No data involved at all, just simple experiments. That is the only way to prove causality. So if “the 78% number that everyone quotes is basically meaningless”, why did you go to all the trouble of plotting out this meaningless data? Why not plot the data corrected for all the factors we know are important, such as hours worked, years of experience, etc. which make most of this disappear? 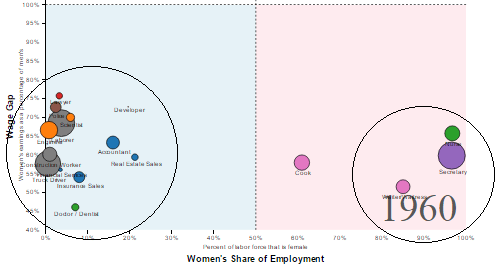 For that matter, how about plotting how much money is spent by women on consumer goods compared to men? Doesn’t “Who gets to spend the money?” seem like a more important bit of information than “Who makes the money?”. I think that you would find a much larger, more interesting, and more meaningful gender gap if you did. As mentioned at the top of the post, the purpose was not to take a stance on whether or not there is a wage gap. It was to show how women’s role in different occupations has evolved over time. By “meaningless,” I mean that 78% number doesn’t tell you whether or not there is a wage gap. But it’s just as meaningless to try to adjust for a bunch of variables. You’re right that if you adjust for hours, experience, education, and occupation, the gap reduces to about 5%. But if you also account for job benefits and college GPA, the gap gets bigger. And it gets even bigger if you look only at full time workers. There are an infinite number of ways to slice it, all arbitrary. Where do you see paths00.js? Are you referring to a different graphic? Ok. Blueshift will be almost entirely webgl based. Though I’m still in the process of building it, so many of the examples shown are not.